ABSTRACT: We know details of ancient classical music of India thanks to a very old tradition of musicological scholarship. Dating as early as the beginning of the Christian era, there is a crescent number of extant treatises in Sanskrit dealing with all aspects of music theory, musical practice, dance, and aesthetics. Indian scholars, in combining studies on the technical and aesthetical features of music, have made clear a semiotic preoccupation, that of understanding the meaning of music. Conversely, we find in the treatises attribution of meaning to ragas, talas, and musical forms, implying also a normative function to the theory of music. However, what was established in the treatises has not corresponded perfectly to the music as practiced in courts and temples. New treatises were in constant demand of being composed to adjust the theory with the current practice. The Western scholarship on the music of India has often employed the methods of ethnology. Yet, this approach has been poor in creating better understandings on issues with which Indian scholars have been concerned for millennia—in particular, the meaning of music. It is my view that the general theory of signs, as proposed by Charles Peirce, can be used as a theoretical instrument that gives to the analyst precise concepts for the study of musical signification. The advantage of this approach consists in operating with a system that enables the study of the traditional Indian music in accordance with its own logic. However, I believe that, between the general theory of signs (a normative science) and the subject matter—music (consisting of acoustic relations and facts of culture)—there must be an intermediate theory, or an applied theory—namely, a theory of musical semiotics. My purpose in this conference is to demonstrate how Indian music was studied with the semiotics of Peirce, the semiotic theory of music built for that, and the results thereof. Indian music has been developing for millennia on two simultaneous courses. First, the performance-practice tradition, whose form of development is the oral instructions imparted by guru to disciple. In Sanskrit, this is called guru shishya parampara. (1) Second, there is the written tradition, or shastric, whose medium is the scripted form of treatises, the study of which is also frequently held on a guru-shishya basis. Both traditions can be thought as interrelated webs of musical signification, for which I imply here a very broad conception of musical sign and its signification process or semiosis. Music is a sign in itself, and the various ways of organizing musical material can be viewed as forms of semiosis. Music, however conceived, has the power of reference, and the objects it signifies range from pure musical materiality, to entities (such as things, real or imaginary beings, persons, and so on) and all forms of individual and cultural representations (again signs), from emotions to political ideas. However, music could not exist if no one interpreted it. Sign interpretation consists of the process of producing or modifying an idea that the sign represents in reference to its object; such production is semiosis itself. Musical interpretation involves perception and cognition and all forms of aesthetic enjoyment. It is also the mental and physical aspects of musical learning and performance. Musical interpretation is certainly the basis of all music criticism and scholarship, and composition would be impossible without it. Hence, musical semiosis, in general terms, is a composite of significations, and its actuality depends necessarily on interpretation. In considering the complexity of signification in all spheres of musical activity, either in India or in other cultures, I realized the need not only of tools for the application of semiotic concepts in musical analysis, but also the need for understanding and distinguishing areas and relevant points of view. This seems to me a very critical issue, for the results of a semiotic analysis change utterly depending on the viewpoint and the focus of the study. It was in the work of the American scientist and philosopher, Charles Sanders Peirce, that I found the necessary instruments and theoretical framework to cope with this project in an integrated and logically sound system. In Peirce’s classification of the sciences, semiotics (or semeiotic) has three branches: speculative grammar, critic and methodeutic (or speculative rhetoric) (CP 1.192). (2) According to Nathan Houser, the scholar who studies speculative grammar deals with the intrinsic nature of signs and semiosis. The scholar examines relations among signs, the nature of the correlates taking part in semiosis, Peirce’s sign trichotomies, and his classes of sign. The study of critic deals with signs in relation to their objects, and especially the condition of signs’ references in relation to their signified objects. Methodeutic studies signs in relation to their interpretants. Thus, semiosis is focused on the interpretant level, and how interpretants themselves can become signs during semiotic processes (Houser 1990 210–11). It seems to me that, just as Peirce divided formal semiotics into three areas, musical studies can also be understood as three interrelated fields, not as broad and abstract as speculative grammar, critic and methodeutic are, but still showing a concern for the following: (1) “the general conditions of signs being signs” (CP 1.444), that is, the intrinsic nature of semiosis, or the study of signs and their systems of inner relationship; (2) “the theory of the general conditions of the reference of Symbols and other Signs to their professed Objects” (CP 2.93), that is, the relation of signs to their objects; and (3) “the necessary conditions of the transmission of meaning by signs from mind to mind, and from one state of mind to another” (CP 1.444), that is, the relation of signs to their interpretants, interpreters, and systems of interpretation. Accordingly, the analytical model I propose comprises three interrelated fields of inquiry. (1) Intrinsic Musical Semiosis, or the study of the musical sign in itself, deals with internal musical signification. It constitutes the semiotics of musical materiality. Intrinsic semiosis encompass musical qualities, actualization of musical works, and the organizing habits of music, such as musical systems. (2) Musical Reference, or the study of musical signs related to their possible objects, deals with the musical signification of a broad class of objects. This field investigates questions such as how a musical sign refers to an object, the possible dynamical objects represented by music and their modes of being, the possible relations between a dynamical object and the immediate object as represented in the sign. (3) Musical Interpretation, or the study of the musical sign related to its interpretants, deals with the action of musical signs in an existing or potential mind. Issues of musical interpretation can be divided into three sub-fields: (first) musical perception, (second) performance, and (a double third) musical intelligence (analysis, criticism, teaching, theorizing and musical semiotics) and composition. In my dissertation this theory was applied to Hindustani classical music (Martinez 1997). Yet, it seems to me that it can be used as a model to analyze other musical traditions. We can reflect on some of these questions. 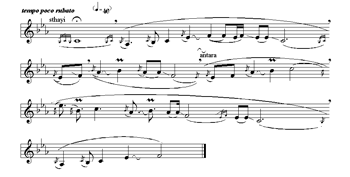 The Example 1 is a transcription of a calan—a musical sketch—composed by D. C. Vedi for raga malkauns. Ragas are fundamental structures of Indian music. They signify a range of possible meanings, which can be studied from different perspectives. I will briefly analyse some of those as a demonstration of the fields of semiotic inquiry I have proposed. The field of Intrinsic Musical Semiosis deals with internal musical signification. As a piece of music organized according to the principles of the Hindustani raga system, this example observes the musical habits (or legisigns) of raga malkauns. This raga is based on a pentatonic pitch set, comprising a minor third, a minor sixth and a minor seventh. The perfect fourth is an important degree, which takes part in several motifs that characterize malkauns. Legisigns signify by means of their actualizations (replicas or sinsigns), which—in Indian music—are somehow flexible, because the performer improvises, choosing the sequence of a raga’s motifs, and producing variations for them during the concert itself. Further, each raga has its peculiar musical qualities, and this is a matter of qualisigns. In this field, sign and object are both of an acoustic nature. Concerning the field of Musical Reference, musical signs can stand for both acoustic and non-acoustic objects. Firstly, in its immediacy, the example can be understood as pure music. This happens when the listener disregards, or ignores, all possible significations but the music itself. Therefore, the listener considers the sign as representing merely sound qualities and their relations. Its meaning is purely musical, and semiosis is grounded on pure icons. Sign, object and interpretant are all musical qualities. Yet any minimally informed listener will recognize that this is an example of Indian music. Now, the sign is an index of the culture that produces this kind of music. The interpretation reaches another level when the sign is understood as a particular musical structure, raga malkauns, which stands for several levels of signification. The representation is grounded on habit, and thus the piece is a symbol. In this case, the interpretant has an essential role, because a musical symbol requires from the listener a certain knowledge that promotes its comprehension. Let us consider some of the objects that malkauns has stood for. His mace running with blood, garlanded with the skulls of heroes, Malavakaishika, surrounded by braves, and bravest of the brave! (2.60, Danielou’s translation 1991, 324). This change of meaning reflects also an aspect of musical signs. Ragas have been evolving continuously and their multiplicity and vitality can be compared with those of living creatures. Gradually through the centuries, ragas, like generations of musical beings, evolved. New forms and meanings were born, they became known and fashionable, and as time passed, old and obsolete, and were to some extent replaced by new popular ragas. Malavakaishika’s significations continued to evolve, and in this century it is considered as a great and solemn raga. For contemporary Indian musicians and scholars, the character of malkauns is that of seriousness or peacefulness, although there are still some references to heroism (see Martinez 1997, 315–17). This brief historical account of a raga illustrates another aspect of symbols, namely, that symbols have a life of their own, and their meaning and use change along with a certain period of time. But are there any features in the musical legisigns of malkauns that could ground the representation of seriousness or peacefulness? Yes, there are several, for this raga signifies not on a conventional basis, but its force, as a symbol, depends on the several iconic and indexical features consecrated by habits. One important aspect of this raga is the tradition of performing malkauns in a slow tempo and with a tendency to explore rather the lower register. Thus, it is possible to identify here a feature of similarity between the musical form of the raga and its character, which is described as gambhir, that is, serious and grave. This representation constitutes a kind of diagram, or iconic legisign, for the music presents in itself qualities of movement similar to a type of character that can be found in Indian literature, the serious and wise hero, whose movements are controlled and solemn. Other aspects of malkauns, such as the slow glissando between the tonic and fourth degree, and the graceful slow oscillation on the minor third can also be thought as iconic of the raga character. The stability of malkauns is also marked by the emphasis on the perfect fourth and its plagal relation with the tonic, which functions as an indexical sign of the seriousness of the raga. Musical Interpretation, or the study of the musical sign related to its interpretants, deals with the action of musical signs in an existing or potential mind. The basic questions in this field are the nature of the musical interpretant (emotional, energetic, logical); and how the sign determines the interpretant (as a sign of possibility, or a rheme; as conveying some information, or a dicent; or as in its character as a sign, or an argument). Perception, performance, scholarship and composition are complex forms of musical interpretants because they are the actual result of semiosis. This is obviously clear in the case of perception. A musical sign reaches the hearing sense and is interpreted as another sign in the mind of the listener, which is further interpreted, and so on. 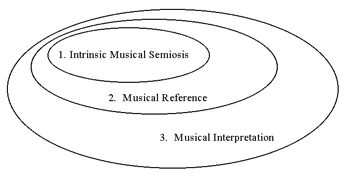 The other three areas of musical interpretants result not from a single instance of perception, but from a cultural-dialogical process of semiosis. Perception starts the process that leads to the causation of musical signs, such as: performed music and compositions, as well as treatises and conferences. This is certainly the most complex and broad field of musical semiotic inquiry and I will rather address here one of its sub-divisions, that of musical intelligence, or the shastric tradition of Indian music. Lewis Rowell distinguishes two modes by which Indian thought has been organized (1992, 27–34): (1) Systematic thinking, represented by the six orthodox schools of philosophy (Nyaya, Vaisheshika, Sankhya, Yoga, Mimamsa, Vedanta), as well as the Tantra and Kashmiri Shaivism; and (2) Symbolic thinking, represented by metaphors, tales, sayings, and the like. I would instead refer to the second group as kinds of analogical thinking (if not iconic thinking), and postulate another class, that of empirical (or indexical) thinking. Therefore, with a semiotic rearrangement, these classes are as follows: (1) analogical thinking, (2) empirical thinking and (3) systematic thinking. The description does not seem to be purely mythological, but a true case of iconic inference and insight, that is, an analogical abduction. The lotus leaves, an image of the tight skin of drums, hit by falling raindrops, function iconically as drums. The text above suggests that the principle of variation of pitch was also discovered by Svati’s observation, for he probably inferred that differences in the diameter of the leaves produced sounds of high, medium, and low frequencies. When considering empirical thought as a form of musical interpretants, I am concerned with inductive reasoning in the description of musical elements and structures, as well as some forms of experimental methods. A classical example is the two vinas experiment described in the Natyashastra (28.24), intended to demonstrate the existence of 22 micro-intervals, or shrutis. It is a truly experimental approach, rather rare in Indian musicology. A much later scholar, Ahobala-pandita (17th century), described in the treatise Sangita-parijata the octave relation, as well as the seven diatonic notes and their intervallic relations, in terms of string division and the position of nodes corresponding to the harmonic partials (see Ranade 1951 177–78). Another aspect of empirical thinking concerns the way Indian music theory changed in respect of the constantly evolving musical practice. The classification of ragas evolved according to the expansion of musical practice. The grama-jati system (see the Natyashastra), in use from the early centuries A.D. to the fifth century, were supplanted by the gramaragas, which evolved from the seven primary gramaragas to a number of 33. But this system was not closed and some 100 other structures, the bhashas, or dialects, were related to the older gramaragas (see the Brhaddeshi). Even the bhashas became aged, and by the late first and early second millennium another system was created by scholars, in order to cope with the new regional deshiragas (see the Sangitaratnakara). Little by little, more ragas were created and classification systems were put in check. By the fifteenth and sixteenth centuries, a paradigmatic change had occurred. By means of analogical thinking, scholars started classifying ragas into families, quite like the extended Indian family (see the Sangitadarpana). Those were known as the raga-ragini systems. A male raga headed a group of five or six wives, the raginis. However, Hindustani music continued to develop progressively, and it was necessary to incorporate new ragas into the systems. Thus, related to the wives, there appeared the raga sons, and then the sons’ wives. Finally, the continuous flow of new structures made the system itself obsolete, and scholars started looking for a new, more capacious system of raga classification. The result was the mela systems of the 17th century (see the Ragavibddha in Nijenhuis 1976), and the Hindustani that system of the nineteenth and twentieth centuries (see Bhatkhande), both based on scale-type classification. (4) The aspect of empirical reasoning in all these systems relates to the fact that scholars were, over the course of centuries, forced to recognize that old systems had become incommensurable with current practice, and that either the system would have to be extended in some way, or another paradigm invented. Some traits of systematic thinking in Indian musical scholarship can be equated to general aspects of Indian thought. First, there is an authoritative character in scholarship, a deep sense of valuing traditions. Lannoy writes that “It is virtually an axiom of Indian culture that the oldest is best” (1971, 272). The Natyashastra, as the oldest extant treatise, has an authority similar to that of the Vedas, even being qualified as the fifth Veda. Second, in its transition from a habit of thinking totally dependent on oral transmission to the written form of treatises, the early, very concise sutras—written on palm leaves—were commented on and amplified with other leaves inserted into the batch, which in turn were commented on again, copied as a single unitary work, glossed again, and so on. Thus, on one hand, there is the encyclopedic character of treatises; and on the other hand was the commentarial aspect of the writings. The latter became a literary genre of its own, the bhashya. The advent of Islamic rule in North India did not essentially change the musical systems and scholarship. It is true that new forms, styles, and instruments were introduced, but all those were assimilated into the mainstream of Indian music. In terms of musical intelligence, there is plenty of evidence of the interest which Muslim rulers took in Indian music. Gangoly writes that “the Moghul patrons took care to ascertain accurately the fundamental principles of Indian musical science, before proceeding to help towards its further growth and enrichment. And for this purpose, more than one authoritative treatise in Sanskrit was translated into Persian as the basis of a scientific investigation” (1989, 141). It may be said that Persian “ethnomusicologists” were at work in the Moghul courts, but in fact ethnomusicology in India is much older. There is evidence that the gramaragas were known in Central Asia by the 6th century (see Widdess 1995, 15–18), and this was certainly thanks to the spread of musical scholarship by musicians and travelers, as Husuan-tsang, a Chinese who traveled in India for fifteen years in the seventh century collecting Buddhist sutras. Musical conferences were another scholarly practice that influenced systematic thought. Many treatises were composed as result of those conferences. The Sangitashiromani, for instance, was written in 1428 by a group of scholars invited to the court of Sultan Malika Shahi. It is also known that Raja Man Singh Tomar, king of Gwalior (ruled between 1486–1516), organized a musical conference, headed by Nayak Bakhshu, which resulted in the composition of a treatise in Brajbhasha entitled Manakutuhala, unfortunately no longer extant (see Faqirullah). The musical conferences organized early in the present century by Bhatkhande were very important in helping classical Indian music to survive in the context of new social and political realities. The conferences represent clearly the idea of semiosis as developing in a community of inquirers, an aspect of scientific thought valued by Peirce: “Let us remember that science is a pursuit of living men, and that its most marked characteristic is that when it is genuine, it is in an incessant state of metabolism and growth” (CP 1.232). Several features of Indian musical intelligence discussed above represent superbly the Peircean idea of the growth of symbols—an organic, overwhelming and never-ending growth—which, thanks to the work of musicians, such as Ravi Shankar, Hariprasad Chaurasia and Zakir Hussain, and several scholars, Indian classical music became known, studied, practiced, and enjoyed worldwide, giving its rich contribution to the musical heritage of mankind. Thank you. Bharata. 1967. The Natyashastra [Dramaturgy], 2 vols., 2nd. ed. Trans. by Manomohan Ghosh. Calcutta: Manisha Granthalaya. Bhatkhande, V. N. 1990–1993. Hindusthani Sangita Paddhati [Hindustani Music Treatise]. Kramika Pustaka Malika [Progressive Book Series], 6 vols. Hathras: Sangit Karyalay. Damodara. 1930. Sangitadarpana [The Mirror of Music]. Trans. by A. Bake. Paris: Geuthner. Danielou, Alain. 1991. The Ragas Of Northern Indian Music. 2nd ed. New Delhi: Munshiram Manoharlal. Faqirullah [Nawab Saif Khan]. 1996. Tarjuma-i-Manakutuhala [The Translation of the Authoritative Inquiry] & Risala-i-Ragadarpana [The Short Mirror of the Raga]. Trans. by Shahab Sarmadee. New Delhi and Delhi: Indira Gandhi National Centre for the Arts and Motilal Banarsidass. Gangoly, O. C. 1989. Ragas & Raginis, reprint (first edition 1935). New Delhi: Munshiram Manoharlal. Houser, N. 1990. O escopo da semiótica peirceana (The Scope of Peircean Semiotics, paper presented in the C. S. Peirce Sesquicentennial International Congress, Harvard, 1989). Trans. by L. Santaella. Face 3(2), 207–215. Lannoy, Richard. 1971. The Speaking Tree. Oxford: Oxford University Press. Matanga. 1992–1994. Brhaddeshi [The Greatness of Regional Music], trans. by Prem Lata Sharma and A.B. Beohar, 2 vols. New Delhi, Delhi: Indira Gandhi National Centre for the Arts and Motilal Banarsidass. Martinez, José Luiz. 1996. “Icons in Music: a Peircean Rationale.” Semiotica 110 (1/2), 57–86. Martinez, José Luiz. 1997. Semiosis in Hindustani Music. Acta Semiotica Fennica 5. Imatra: International Semiotics Institute. —————. 1997. Semiosis in Hindustani Music. Acta Semiotica Fennica 5. Imatra: International Semiotics Institute. Nijenjuis, Emmie. 1976. “The Ragas of Somanatha.” In Orientalia Rheno-Traiectina. 2 vols. Eds. J. Gonda and H.W. Obbink. Leiden: Brill. Peirce, Charles S. 1938–1956. The Collected Papers 8 vols. Eds. Charles Hartshorne, Paul Weiss, and Arthur W. Burks. Cambridge: Harvard University Press. References are given as (CP [volume number]. [paragraph number]). Peirce, Charles S. 1982–. Writings of Charles Peirce: A Chronological Edition. Eds. M. H. Fisch, E. C. More, C. J. W. Kloesel. Bloomington: Indiana University Press. —————. 1982–. Writings of Charles Peirce: A Chronological Edition. Eds. M. H. Fisch, E. C. More, C. J. W. Kloesel. Bloomington: Indiana University Press. Ranade, G. H. 1951. Hindustani Music: Its Physics and Aesthetics. 2nd. ed. Bombay: Popular Prakashan. Rowell, Lewis. 1992. Music and Musical Thought in Early India. Chicago: University of Chicago Press. Sharngadeva. 1978–1989. Sangitaratnakara of Sharngadeva [The Mine of Musical Jewels]. 2 vols. Trans. by R. K. Shringy (under the supervision of Prem Lata Sharma). New Delhi: Munshiram Manoharlal. Widdess, Richard. 1995. The Ragas of Early Indian Music. Oxford: Clarendon Press. 1. Transliteration of Sanskrit, Hindi and Persian words and names have been simplified here, as the special fonts for the diacriticals are not supported in ASCII/HTML. These words are just marked as italic in this article. 2. References to the Collected Papers of Charles Peirce are given as (CP [volume number]. [paragraph number]). 3. Among the several ancient drums, only the double faced, barrel shaped mrdanga is still known and played. Pushkara refers to several kinds of wooden drums: panava was a form of hour-glass drum, alingya a small face drum with a body like a “cow’s tail,” ankika a middle size drum with a body like the myrobalan, and the dundubhi an earthen kettle-drum. 4. The linearity of my explanation here should not give the reader the idea that each musical system of raga classification substituted for the earlier system in a diachronic way. Rather, some of the systems existed simultaneously, overlapping each other for centuries. Transliteration of Sanskrit, Hindi and Persian words and names have been simplified here, as the special fonts for the diacriticals are not supported in ASCII/HTML. These words are just marked as italic in this article. References to the Collected Papers of Charles Peirce are given as (CP [volume number]. [paragraph number]). Among the several ancient drums, only the double faced, barrel shaped mrdanga is still known and played. Pushkara refers to several kinds of wooden drums: panava was a form of hour-glass drum, alingya a small face drum with a body like a “cow’s tail,” ankika a middle size drum with a body like the myrobalan, and the dundubhi an earthen kettle-drum. The linearity of my explanation here should not give the reader the idea that each musical system of raga classification substituted for the earlier system in a diachronic way. Rather, some of the systems existed simultaneously, overlapping each other for centuries.